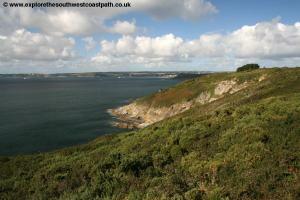 This walk begins at Place on the Roseland Peninsula just across from Falmouth. 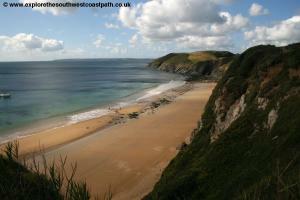 The walk is initially a quiet and fairly gentle walk along cliff tops around the estuary. 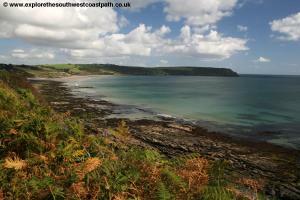 After passing through Portscatho the walk becomes a little harder with the coast more undulating but there are also some good sandy beaches on this part of the walk. 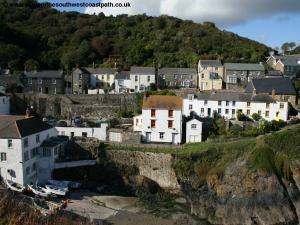 The walk ends at the small but charming fishing village of Portloe, with numerous cottages clustered around a narrow harbour. There is no mistaking the transport is a bit of a challenge on this walk. 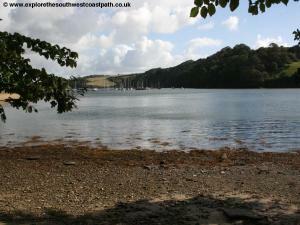 The walk begins from the tiny hamlet of Place, near St Anthony just across the river from St Mawes. 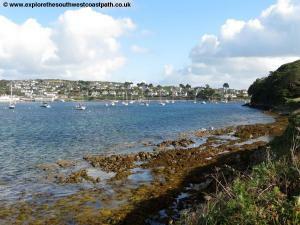 This is because the official route of the coast path from Falmouth is to cross via ferry to St Mawes and then another ferry from St Mawes to Place. If you are travelling to the start of the walk by car then access is not easy. 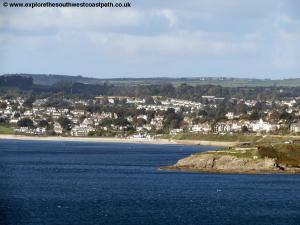 From the A390 (St Austell to Truro road), take the A3078 in the direction of St Mawes. 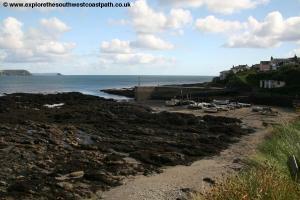 After around 7 miles and just after you pass through the village of Trewithian, take the left turn for Portscatho. 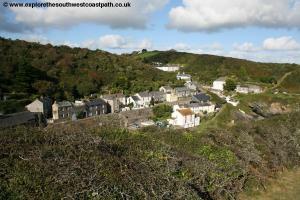 Continue on this road signed for Gerrans rather than going through Portscatho itself. When the road splits keep left for Trewince. The rest of the route is mostly on single-track roads. Pass through Trewince and and towards Bohortha. Here fork left for St Anthony. 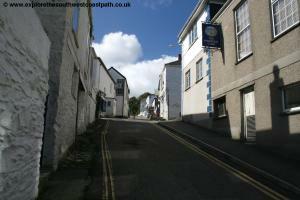 There is no car park at Place and the road is mostly too narrow to park along. 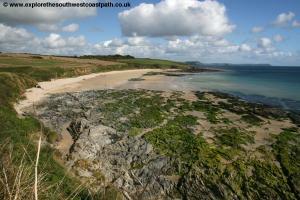 Therefore the nearest car park is to continue on this road to the National Trust car park at St Anthony Head. From here you could walk back to Place along the road to start the walk or if you are likely to return to your car via the ferry do the part of the walk from the ferry to Place pack to St Anthony Head at the end. During the summer months when the ferry runs it may well be easier to park in St Mawes which is much easier to access via the A3078 and has a car park, then take the ferry from St Mawes to Place. If you are driving, when making this walk you need to consider how to get back to your car. 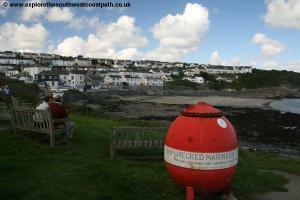 There is a bus service from Portloe but it does not go back to St Anthony, Place or St Mawes. 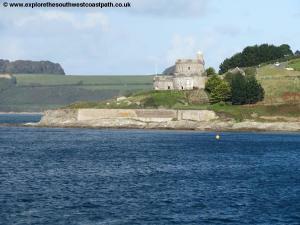 There are no buses at all to St Anthony or Place so the only public transport is the ferry service from St Mawes. This typically runs from 1st April to late October or early November, but does not run in the winter. So if you are planning this walk outside of this time you will likely need to take a taxi to get to Place. 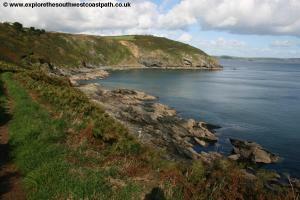 The only way to get back to Place from Portloe is to take the bus from Portloe to Tregony. 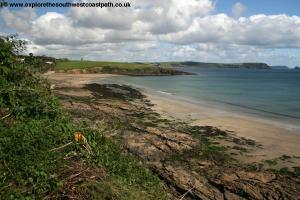 Then take another bus from Tregony to St Mawes and then the ferry over to Place. The connections at Tregony are typically poor however and you may well end up waiting for an hour or so in Tregony. You may instead prefer to park in Tregony in the morning, take the bus from Tregony to St Mawes, then the ferry from St Mawes to Place to get to the start of the walk. 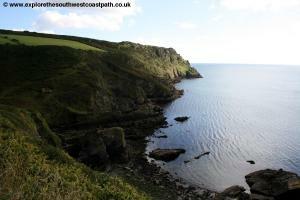 Then at the end of the walk take the bus fro Portloe back to Tregony, which is direct but only runs once every two hours. See below for details. If you are travelling by public transport the easiest access points are either Truro or Falmouth, both of which have regular train services. 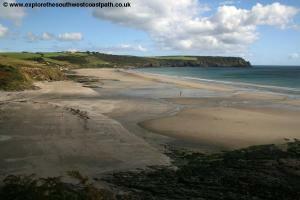 From Truro, take Western Greyhound Western Greyhound bus 550 to St Mawes. 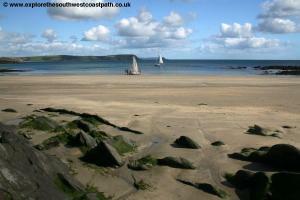 This runs roughly once every two hours (seven days a week) from Truro and takes around an hour to reach St Mawes. 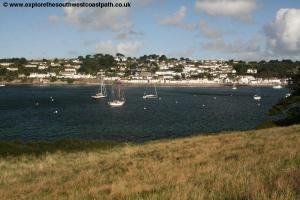 From Falmouth take the St Mawes Ferry ferry, which runs 7 days a week all year round. In the summer this runs every 20 minutes reducing to hourly during the winter. Check the times of the first and last ferries before leaving however. From St Mawes you can change onto the Place Ferry which runs only from 1st April to late October or early November (there is no winter service). The ferry runs every 30 minutes during it's operating period and the crossing takes around 10 minutes. There is no through ferry ticket so you have to buy tickets for both ferries separately. It is worth considering the Fal Mussel Card. This is a public transport smartcard valid on most of the ferries in and around the Fal, including the St Mawes and Place ferries, trains between Truro and Falmouth and bus services 550 and 551 which are the relevant services for this walk (it is valid on several other bus services too). The card is available for various lengths of time, from 1 day up to 6 days and is worth considering especially if you are planning other walks in the area. The Place ferry normally drops you at a little concrete slipway (Toddy Steps) but at high tide you might arrival on the floating pontoon instead. Either way on coming off the ferry turn right. 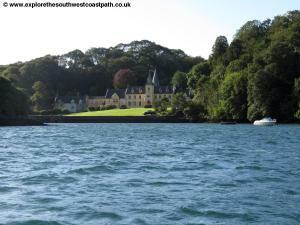 Follow this track round to a small car parking area and continue on the track passing a house and the entrance to the large and impressive Place House on the right, which you could see from the ferry but which is private. 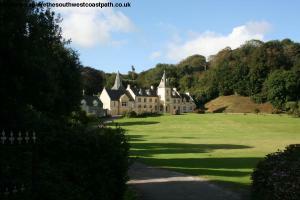 After around 100 metres turn right on the signed path leading to Place Church, which is worth a visit. After passing the church you turn right onto the track that leads back down to the coast at Cellars Beach. 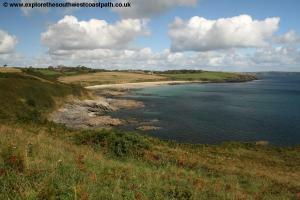 This cuts off the little headland ahead, going across the eastern edge of a couple of fields to re-join the coast where you turn left and follow the path along the coast to Carricknath Point. 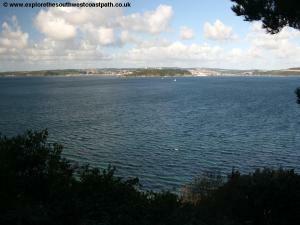 Here you have good views to St Mawes to the right and Falmouth straight ahead, just across the river. Continue on the good quality coast path along the top of the low cliffs here, passing a couple of small sandy beaches (at low tide, anyway). 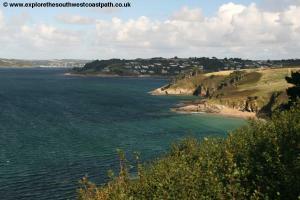 This soon begins to rise up to the National Trust owned headland of St Anthony Head. 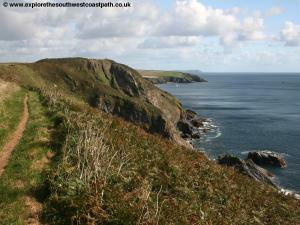 As you near the end of the headland you can continue a short distance to the Lighthouse but note that this path is a dead-end. 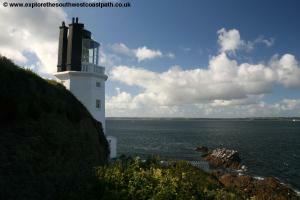 The correct path is to turn sharply to the left, almost doubling back up hill just before the lighthouse. When there is another path off as a very sharp right turn back round do not take this (it leads to a bird hide but is otherwise a dead-end), instead keep ahead to emerge near the car park and toilets. Here turn right passing the toilets and out to the battery. 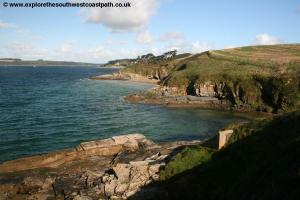 Follow the obvious coast path around a little bay here and onwards to Zone Point. 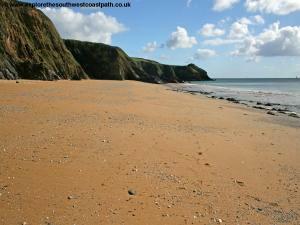 The path now continues along the cliff top along the undulating cliffs to Porthbeor Beach, a lovely sandy beach just south of the village of Bohortha. 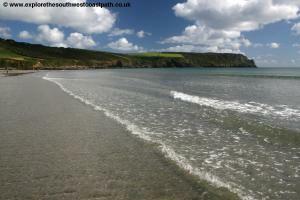 There is access down to this lovely sandy beach and it's remote location and lack of nearby parking means it is highly unlikely to be crowded. 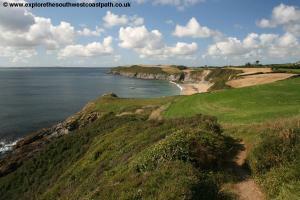 The coast path is now an easy walk along the cliff top around Portmelling Head and Killigerran Head to reach Towan beach and Towan Beach at Porth Farm. 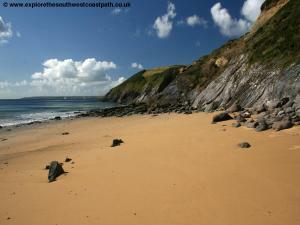 Although the map suggests this beach is rocky there is also a good deal of sand and easy access down to the beach. 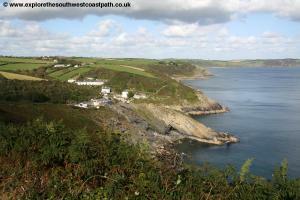 The coast path ahead is easy and obvious so for the next mile and a half you just follow the path along the low cliffs until you come to the town of Portscatho. This is a pretty little town crammed around the small harbour and beach and the village has a few faculties, including a pub. 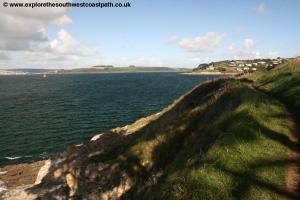 The path goes round the edge of the headland and follows the road past the harbour. Turn right with the road past the slipway which leads down to the beach. Ahead don't take the slipway (unless you wish to explore the beach), but continue along the narrow road with houses on both sides. 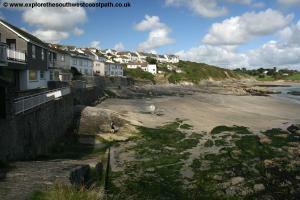 Soon this road narrows to a track as the houses end and you are then walking behind the beach. After around 500 metres you come to Porthcurnick Beach which is another glorious sandy beach with a sheltered south east facing location looking back over Portscatho. There are toilets and a car park here. 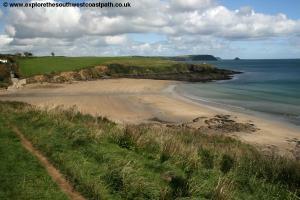 The path briefly goes along the back of the beach until you reach the road. Go up this road and as soon as you are level with the low cliffs, turn right along the obvious coast path along the cliff top. This leads out to Pednvadan and the lookout station and continues north to Portbean Beach. 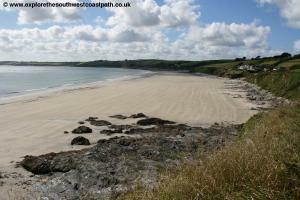 This is another sandy beach, but rocky at low tide and the path very briefly goes down along the back of the beach for a short distance before re-joining the coast path. This soon comes out into a field and you head for the far right corner, nearest the sea to continue along the cliff top. 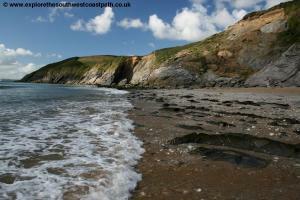 There is access to another little sand and rock beach here and the coast path continues along the low rocky cliffs to Creek Stephen Point. Round this and continue north around the back of Creek Stephen. 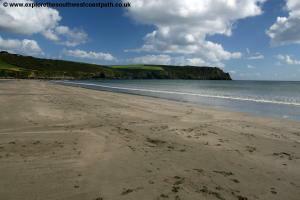 Ahead is the larger beach at Treluggan Cliff though the first part is mostly rocky. The path briefly goes inland around Pendower Court and then joins the road where you turn right past a small car park and continue along this road around the former Pendower Beach House Hotel, which has been derelict for several years. The road here is now closed ahead due to erosion and you can take a path down to the beach. 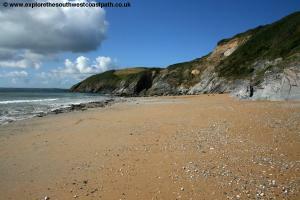 There is access to the beach here, which is now a glorious sandy beach, Pendower Beach. 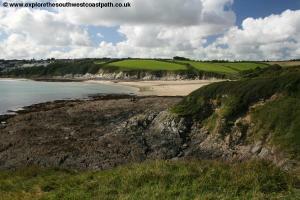 The coast path continues along the low cliffs behind the beach except for a small diversion behind the Nare Hotel. This can be avoided if you prefer if the tide is out by walking along the beach to Carne Beach at the eastern end of the bay. At Carne Beach where the road joins meets the beach take this road up and then fork right as the road turns inland on the coast path which continues along the cliff top. 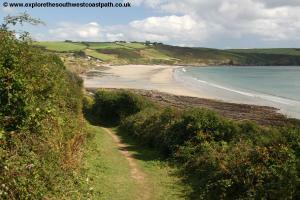 The path splits after around 200 metres, with a path to the left off to Carne. 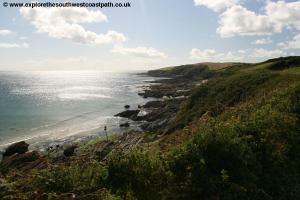 Ignore this and keep to the most coastal of the paths. Here you round the rocky cliffs at Tregagles Hole. 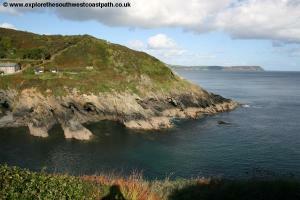 Round this rocky little cove where there is a steep descent followed by a steep ascent back up the other side. 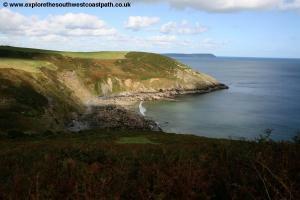 Now follow the main coast path out to Nare Head. 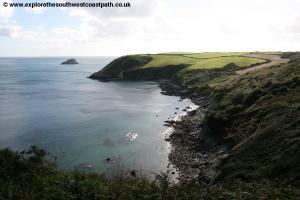 The coast path itself short-cuts the very end of this headland but there is a path out to it, which is worth taking for the good views including Gull Rock just to the east. 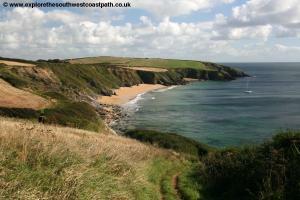 Keep to the main coast path, the lower of the two paths along the eastern edge of Nare Head and along the back of fields heading due north. 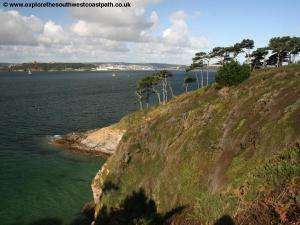 There is a small car park just away from the coast path here, which cuts off the edge of Horse Rock and then passes behind Kiberick Cove, another rocky beach. Follow the wide and obvious path on from here around The Blouth. Continue north on the obvious path around the back of Parc Caragloose Cove which soon drops down to sea level and then back up the other side to the farm buildings above. 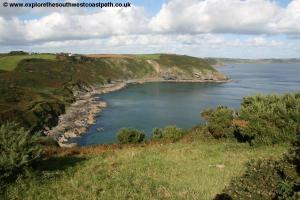 Take the coastal path around the cliff top here and soon you are overlooking the beautiful village of Portloe, the end of the walk. 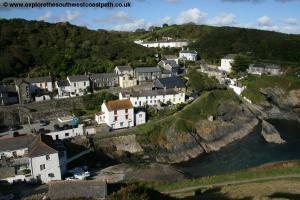 Follow the path around the cliff to the little harbour which is a small rocky inlet with the village crammed into the slopes around the harbour, like so many Cornish coastal villages. The walk ends here. From the harbour take the road up from the harbour uphill to a junction with a church straight ahead. Turn right here and the bus departs from the road here next to the church (there is a bus stop and timetable board on the south side of the road). 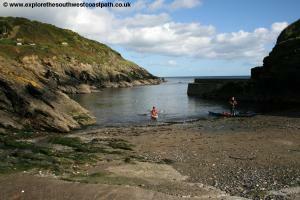 The only public transport from Portloe is Western Greyhound service 551. This runs once every two hours to Veryan in one direction and Tregony and Truro in the other. Note that the last bus towards Truro does not stop in Portloe. Instead you need to catch it on the way down to Veryan and then as it turns straight back round at Veryan to get back to Truro. From Truro there are regular buses and trains to Falmouth and then you can catch the ferries on from there to St Mawes and Place but remember that the Place ferry does not run in the winter and also check the ferry operating times for the last ferry. An alternative is to change buses in the village of Tregony onto service Western Greyhound 550 for St Mawes however the connections are often poor. 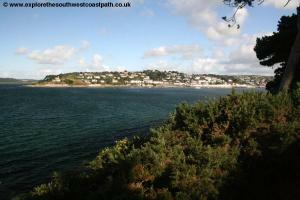 Here are photos along this section of the coast path. Click each image for a larger version. Ordnance Survey Landranger Map 105 covers this area of the coast path and is available in major book shops nation-wide, online retailers and also local book shops and information centres. Or see the links below.